Doesn’t look bad from here. Rattle can chrome has improved. 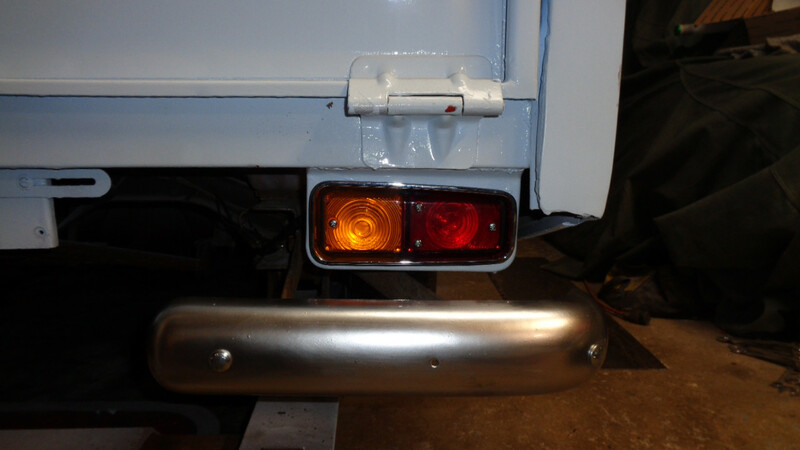 I am positive that it would even have a better result if I took the time and made them perfect before spraying them with the "Mirror Chrome" paint, but after painting the truck it is laugh out loud obvious there is no such thing as perfect work in my world. I will let these bumperettes dry a couple days and then spray them with a 2K clear coat made for automobile applications as also suggested in harsh environments, I need to do this before I handle them too much as i already left a fingerprint on one from handling it even though it was completely dry, it was mentioned that this stuff was delicate and the surface was easily damaged. 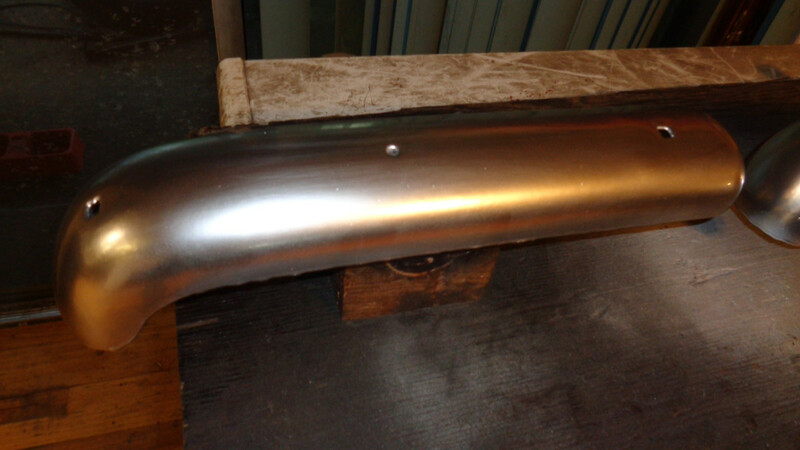 I also mentioned that this Mirror Chrome paint is for indoor use and the clear coat that is made for this product is also for indoor use, but after reading about this product I found out that others suggested/used the 2K automotive type clear coat for motorcycle gas tanks, and other such outdoor uses, it is supposed to protect the finish better. At first I thought that the longer this stuff dried the more shiny it got, but it does not appear to be true, one was done 3 days ago and this one was done today(this morning) and they look/shine the same, I am still going to wait a while/few days before clear coating them. When I do clear coat them I was wondering if I should soak them or should I put several light coats on them, I found if I applied the paint onto the truck to the point it wanted to run it looked better, but I went past that point in several places as I could not tell when it was to that point and it did run, then what I did was soak that area till it was dripping on the ground and them areas came out the best, I could just soak these bumperettes in clear coat and let them dry with drips on the edges and clean up the edges after they dry, the way I paint them none of the edges touch anything, the bumperette edges are held up off the surface from the back side/inside. I did some more reading about this "Spaz Stix" product yesterday, they are saying if you want a chrome like finish, the surface your going to paint has to be smooth as glass, well the first one I sanded on before spraying the gloss black on for the second time I thought I had it really nice, well it was not really nice, it was not even close to nice, I suspect I cannot see so good anymore. Also they said that when clear coating the parts, one has to spray a bunch of thin layers of clear coat on as a heavy coat will lift the "Mirror Chrome" and one will lose the chrome effect, I am not sure I can put that thin of a layer on without buying a hobby paint gun, and i have no use for a hobby paint gun except to do this, I am going to try using my small automotive paint gun. If you use your regular gun, just turn the screw that limits the travel of the trigger to control the flow. You could also turn the fan way up, but then you get a lot of waste. I would agree to do multiple light coats with the recommended flash time between coats. The 2k clear should add good shine to the bumpers as base coat paint is fairly flat when sprayed and you get all the gloss from the clear. I do not care as much about waste as putting too much on and having to start over again. I do not know what flash time is, I just searched it and still don't understand it, this below is what I read about the "Mirror Chrome" paint, notice it says it flashes almost instantly. Start painting the Mirror Chrome using a light dusting effect. 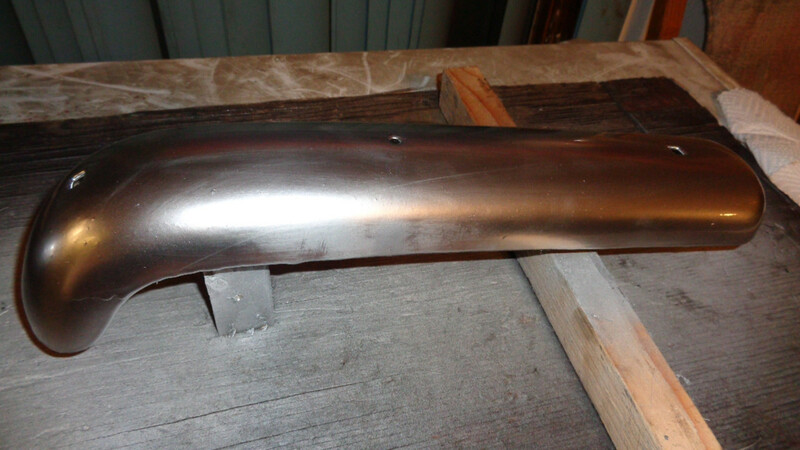 One of the best ways to tell if you are spraying it on properly is that you will see the Mirror Chrome paint hit the surface and flash almost instantly. If using an airbrush, you will be spraying around 15 to 20 psi. 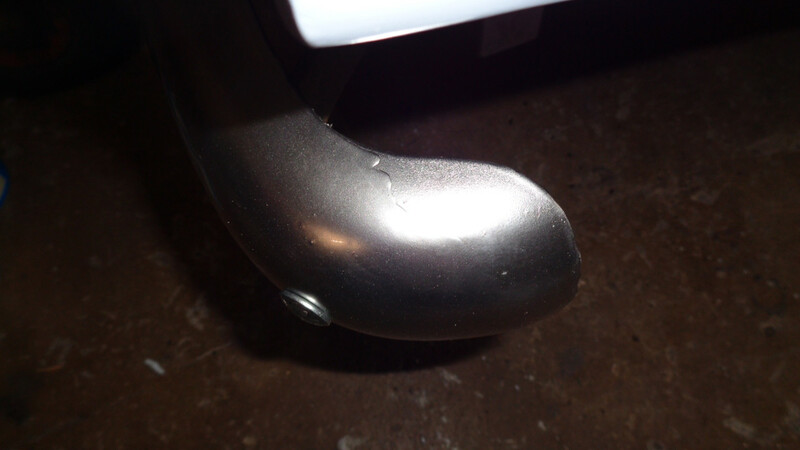 Be sure to use a small amount of Mirror Chrome paint with a substantial amount of air. Apply the Mirror Chrome in light, even coats until you have achieved the desired effect. Other paints talk about flash time being much longer, I have no idea how long the flash time is with this 2K Shop-line JC815 I have, I have searched it and came up with nothing other than some like the brand and others use something else. Flash is just the dry time between coats. According to the data sheet, it’s 3-5 minutes between coats at 70f. If you don’t let the paint flash before putting another coat on, the paint underneath does not have time to release the solvents and the paint on top seals it and it will remain *soft* Andy in some cases will cause bubbles in the surface called solvent popping. OK, that helps, Thankyou, I could find nothing about flash times, most of the searches had the JC815 in the results but immediately started talking about other numbers and the product in general, no specifics, but I likely was not using the correct search words. I suppose it would have been better if I understood flash before painting anything, now I have changed the way I think about it, this might be the reason for some of my other issues, I suspect this could cause paint not to stick all that well also. Flash really should not have anything to do with adhesion. It’s more a curing issue. Whenever you buy automotive paints, the jobber should data/p sheets available that give you all the info you need to paint with, including catalyst, reducing, flash, air pressures, tip sizing, etc. Thay can be a little tricky to find online sometimes. I was not able to immediately find yours. You said something about it staying soft so that made me think of adhesion. I am going to try and spray them with clear in the next couple days, I hope it goes well, I keep the parts and paint inside where it is averaging 75 degrees, but I take them outside to paint them and then move them inside when I am finished spraying, it is in the 50s outside, but normally they are only out there 5 minutes, but 3-5 minutes between coats will put them outside longer so I will use two 500 watt work lights to keep them warm. Today I am putting up another tarp roof on the side of the house, the one on there now has holes in it. 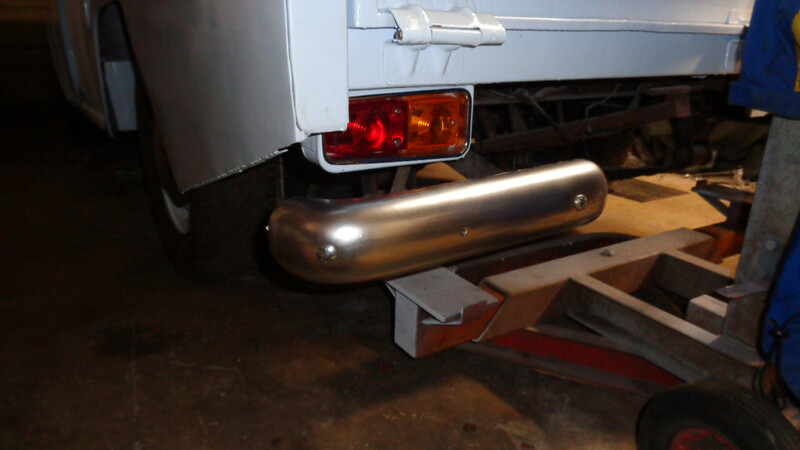 Well the bumperettes are clear coated, they look like very shiny silver. 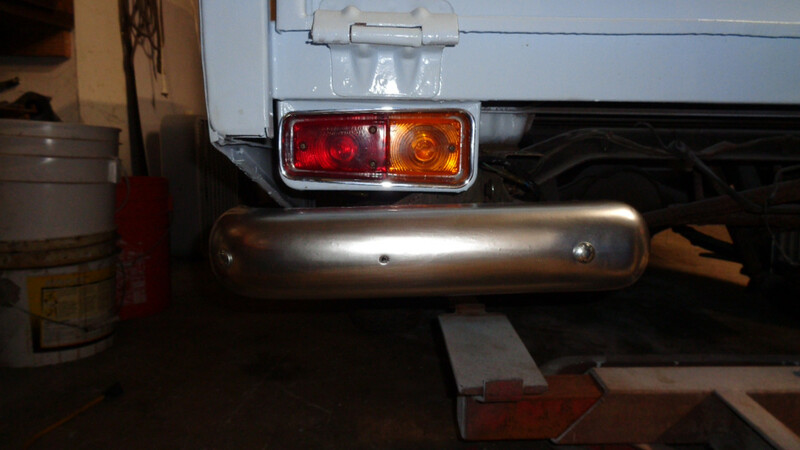 I do not believe that I did this correctly, but I also do not believe that even if it was done correctly that it will look like chrome, not real chrome anyway, it's always going to be silver colored, one might be able to see their reflection in it, but it is going to be a silver reflection, not chrome like a mirror. I think they will look alright on the truck, but that was a lot of effort for what I got, I believe that a very high gloss silver will look the same so I will try that on the one hubcap and see what I get. I am thinking that this paint is made for RC models(cars) with clear bodies, if this was painted on the inside of the body and backed with gloss black and then clear coated/sealed I believe the result will be way different, I believe it will look like a mirror if done properly. 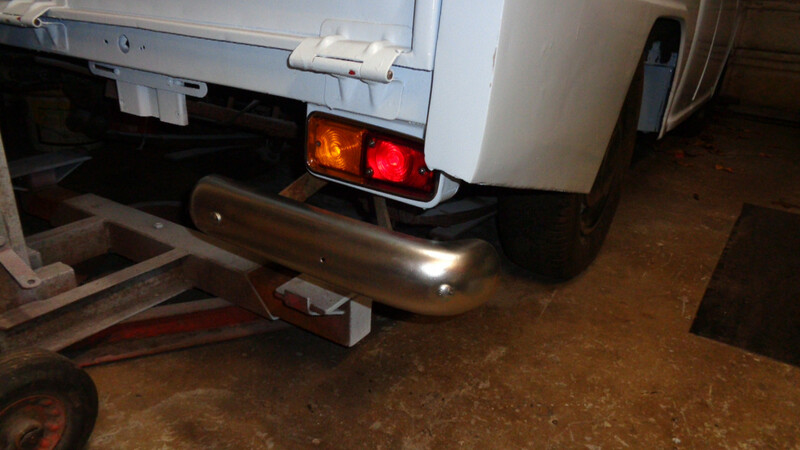 I put them on the truck today, I still need to buy chrome mount bolts to replace the zinc coated ones on there now. You know, Wayno, those look just right to me. I know you were a little disappointed that they aren't a true chrome but that's not necessarily a bad thing. They just look like old, aged chrome to me. If they were too perfect they'd look out of place, in my opinion. Nice job. I agree. 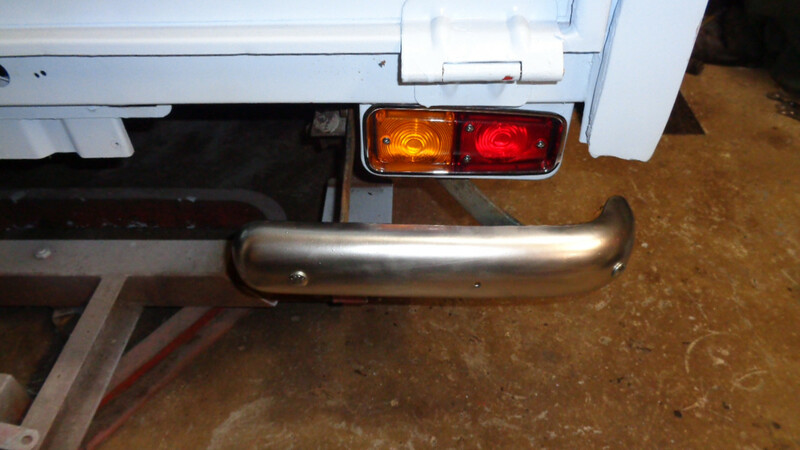 And the zinc bolts look like they match the bumpers just fine to me. Well done in my opinion. I can live with the bumperettes the way they are, but the mount bolts I do not like as they have raised letters on them, they are just cheap zinc covered/plated carriage bolts, they do match the color so if I can find a smooth head zinc plated type I will buy them, if not then I will compare Stainless Steel to the zinc plated to see how close the color is, if they are all ugly I will buy a chrome plated type as they have all these types at the hardware store near me. I can say with certainty that I can do a better job on the bumperettes if I sand them down and do it again, they look alright in the photos, but I am not taking photos of the bad areas, I am standing back and taking photos from a distance, even if I do them again the general color you see will be the same, but it will likely reflect images better, not like a mirror, but better than they are now, this is way better than silver. I know a guy that paints cars that can make it look like you are looking in a mirror when looking at the flat part of a truck lid, the one I seen was painted black, I suspect that he could do that with this paint, but I do not think it can be done with silver, otherwise it would be the way to do it and we would not need "Mirror Chrome" paint. Here is one spot that didn't work out. Well I could not find zinc plated carriage bolts with smooth heads so I bought stainless Steel, the color is close also. 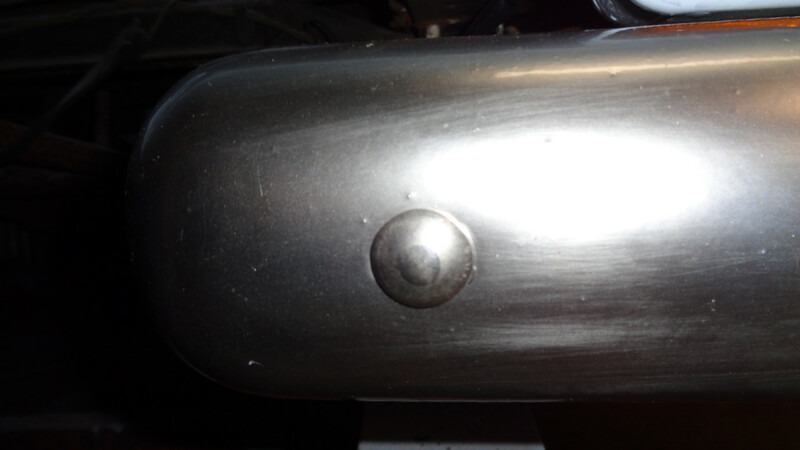 You can see the bumps around that bolt head that were caused by the POR15 bubbles, that POR15 doesn't sand very well and when I did sand it it appeared I used 40 grit, so the last coat didn't get sanded, to me it felt a lot smoother than it looks, I guess having leather for skin on my hands is not a good thing. If I do them over again in the future I will just sand smooth what is there and spray with black gloss paint and forget about the POR15, but understand that these bumperettes had huge rust pits in both of them, especially on the bottom, the pits were all filled with the POR15, they look way smoother right now than they did when I started.